Martial law will happen just prior to the commencement of World War III. A series of false flag events will occur prior to the implementation of martial law. America is on a collision course with destiny! For the past three years, I have been very clear in that I stated that we were plunging into an economic collapse and this collapse would happen prior to the implementation of martial. 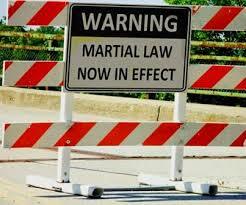 Martial law must be implemented before World War III in order to wipe out all domestic resistance to the war effort. With another false flag shooting, we don’t have to wait any longer, America is rapidly approach its final moment of its demise. The next false flag event will likely collapse this fragile economy. When it does, food will not be shipped to your neighborhood grocery store. The American economy will come to a complete standstill. Economic collapse is imminent. Michael Snyder just wrote an excellent analysis related to the true state of the economy. He was quite clear and convincing in his presentation that America is already in free-fall. 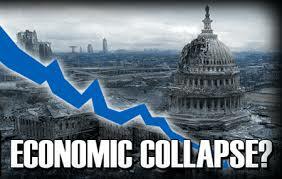 Every economic indicator says the economy is collapsing like a house of cards except for the Stock Market. When the Stock Market crashes, the end is here. Oil has crashed as it is now selling for less than $40 a barrel. This is a huge chest pain before the heart attack. Because this fact, couple with the fact that Baltic Dry Index has reached an all-time low speaks to the fact that very soon, there will not be the necessary cash to finance the shipment of food to market. When this magic moment occurs, the United States will cease in its present form. It will be a case of every man for themselves. The chain of events will be underway that will result in planetary madeness resulting from World War III. Michael Adams is reporting that yesterday’s mass murder has all the elements of a false flag event ad I wholeheartedly agree with im. Coupled with the Oregon shootings earlier this fall and with all of this most recent rash of contrived shootings, speaks to Obama’s intent to seize American guns by one means or another. I do not think Obama is foolish enough to perpetrate a Lexington and Concord event. He will simply declare guns to be illegal and go after high profile dissidents through organizations such as Jade Helm 16 which has emerged to replace Jade Helm 15. He will also move to make ammunition nearly unobtainable through taxation. My research has revealed that there are 17 elements of Obama’s martial law plan. Sixteen items on this list have been fulfilled. Until Obama has all but erased private gun ownership, martial law and World III will have to wait. With anymore false flag shootings, private gun ownership will be in jeopardy. And the 17th element of Obama’s martial law prerequisites will be fulfilled and then all hell will break loose across this country. This is another case of a live training drill taking place which is related to the actual event. We saw this in 911, the 7/7 London bombings and a whole host of other false flag events (Natural News). Yesterday’s mass shooting is one of the final pieces in the puzzlewhich will culminate in gun confiscation, martial law followed by World War III. I have been warning readers to get prepared. Time is almost up! Finalize your preparations. Do what you can before we reach the inevitable conclusion. 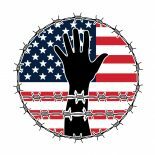 This entry was posted on December 5, 2015 by conspiracyanalyst in False Flag Operations, Societal Collapse, Society, US News, War & Peace and tagged False Flag, Martial Law.